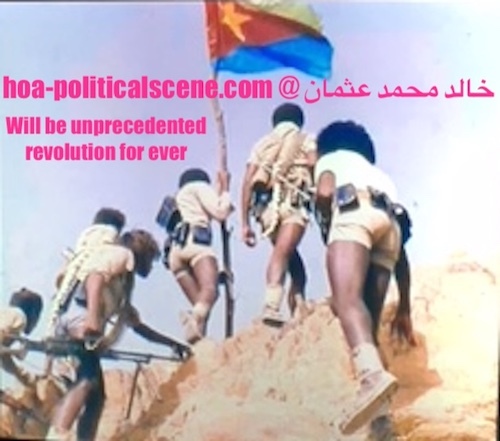 Unprecedented Eritrean Revolutionary Principles Like the Revolution! What are the Eritrean Revolutionary Principles? Did You Know Anything about the Eritrean Revolutionary Principles? 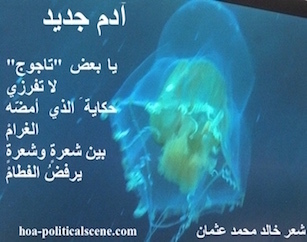 hoa-politicalscene.com/eritrean-revolutionary-principles.html - Eritrean Revolutionary Principles: They are just unique, or unprecedented like the Eritrean revolution led by the EPLF. So, write about those revolutionary principles of Eritrea on the comments form at the bottom of the page, or at the special form on Eritrean Political Comments. OK, I'll tell you about them, as I have been there and seen that since the seventies in the last century. I know the mainstream line of the Eritrean struggle in out. Liked this page about the revolutionary Eritrean principles? Buy me a cup of Suwa, when you buy my tragedy book you see at the right. If I were Eritrean, I will appreciate the Eritrean revolutionary principles! However, I appreciate them even though I am not Eritrean. 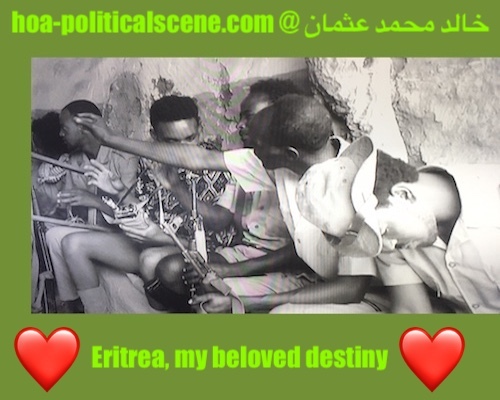 For ten years of my life in Asmara, people considered I am Eritrean and the media and many officials and leaders of the trade unions considered me as Eritrean revolution's friend. Evidentially, my political writings come from somebody who had been there and deeply engaged with the revolution to teach those principles through the media and the education ministry while carrying my job as journalist in Asmara. Any harsh political situation in the country should not hinder me from appreciating such values in the Eritrean revolution. What about you? Let me read your thoughts through the form at the bottom of the page. 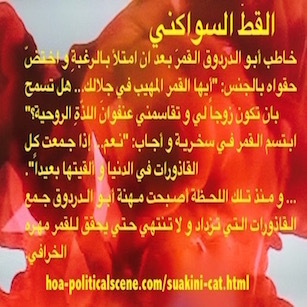 This page is a continuation to the Eritrean Political Differences here. The article is also excerpt from the first book about the Ethio-Eritrean last war I wrote in the 90s and published excerpts from it on the official newspaper. hoa-politicalscene.com/eritrean-revolutionary-principles.html - Eritrean Revolutionary Principles: Eritrean veteran fighter & singer Bereket Mengisteab. I have just polished some thoughts in it to divide it into 2, 3 pages, knowing that writing for the web is so different from writing elsewhere offline. Download the Net Writing Masters Course to know the difference. Two Eritrean revolutionary principles have maintained in theory and practice the long way to the liberation of Eritrea that the Eritrean People's Liberation Front (EPLF) has crossed successfully to achieve its goal in 1991. Since the early days of its birth in the seventies, the Eritrean People's Liberation Front (EPLF) has developed the self-reliance principle and the self-abnegation principle deep in its manifesto and made those revolutionary principles Eritrean cultural and ethical behaviour. The Eritrean revolution, well the Eritrean government tries hard to implement those two Eritrean revolutionary principles to keep the identity of the country and the nationals and to avoid absorbing schemes the Eritreans face from different directions. hoa-politicalscene.com/eritrean-revolutionary-principles.html - Eritrean Revolutionary Principles: Warrior's break - young Eritrean fighters having a break on Eritrean music video. The Eritrean Opposition vs the Eritrean Revolutionary Principles! However, although that is not a reason for totalitarianism, the government could manage building a national consensus by gathering the best of the opposition groups and preparing the national dialogue to reach common national goals. They could also depend on those Eritrean revolutionary principles while going such direction. The government indicated its will to call the Eritrean opposition to enter the country to share the political life many times. That call started during the transitional period by calling the other Eritrean fronts to the country and some figures in those fronts entered the country. However, some of those who came in during that time had personal ambitions to hold high positions in the government. OK, let us agree on that nothing left of the principles of any political organization when a person sells its organization to hold a high job in the government he opposed. It is always hard to achieve national goals when people think of getting personal benefits from any political opportunity like that the government has given to the Eritrean opposition. 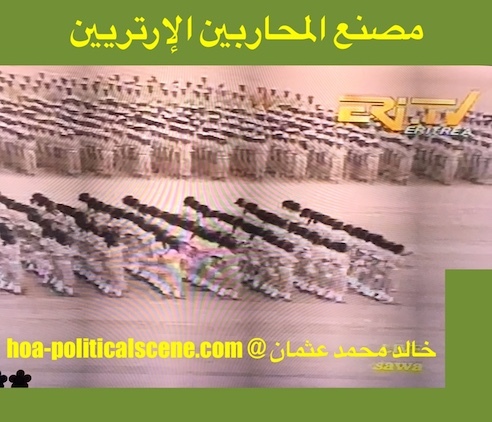 hoa-politicalscene.com/eritrean-revolutionary-principles.html - Eritrean Revolutionary Principles: SAWA Defence Center - The Eritrean Military Academy in the Gash-Barka Region. The Warrior's fabric. They thought in the Eritrean opposition of direct political sharing through elections at that time, while the political situation was yet to be good for such participation in quick elections. There were many challenges and of course duties for the government to achieve to maintain the interior national front and to prevent two creeping anti-national schemes to infiltrate this national front from both Sudan and Ethiopia. The government has invested that occasion to make sure of the personal ambitions and the personal goals of the political figures they have invited and welcomed inside the country. They already know some of them and know that they lack those Eritrean revolutionary principles. They know very well in the Eritrean People's Liberation Front (EPLF) until this moment that they have been self-reliance and dependent on their national sources to achieve the independence of the country. 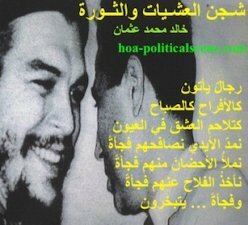 In comparison, the other political groups were dependent on some foreign powers in the Middle East and the leaders of these groups have personal interests during the liberation struggle, forget about being corrupt and using the financial aids given to the revolution to live wealthy. 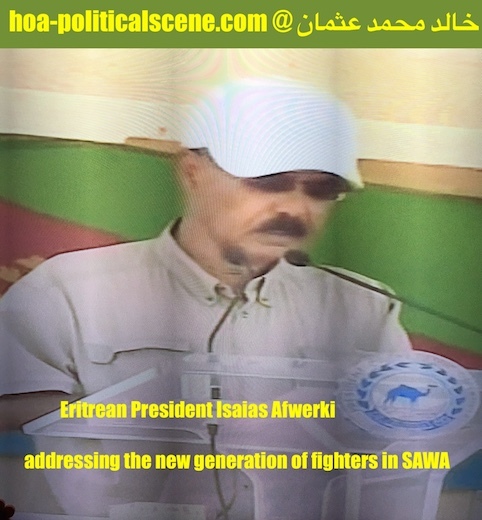 hoa-politicalscene.com/eritrean-revolutionary-principles.html - Eritrean Revolutionary Principles: Eritrean President Isaias Afwerki addressing the new generation of fighters in SAWA. Those figures in the Eritrean opposition know that leaders of the ruling front are suspicious and they always give priority to the national issues and to those Eritrean revolutionary principles, sacrificing their personal interests. At that time, it was common to hear refusal to any attempt to polish some leaders or talk about personal heroic experiences they have come through to the independence of Eritrea. 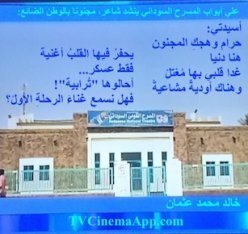 However, they allowed talking or mentioning the heroic experiences only in the media for the martyrs of the Eritrean revolution. Many of those political leaders in the Eritrean revolution have hesitated too long to accept writing about themselves. They just disliked it. 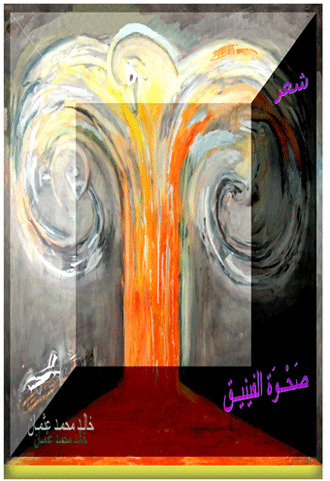 Self-reliance and self-abnegation are two Eritrean revolutionary principles. Sacrifices made during the first ten years of the independence in addition to the sacrifices made during the liberation are Eritrean revolutionary principles. I understand now why the leaders of the revolution were unique in that direction to re-build the national self-esteem and make people open to sacrifice for their nationality. 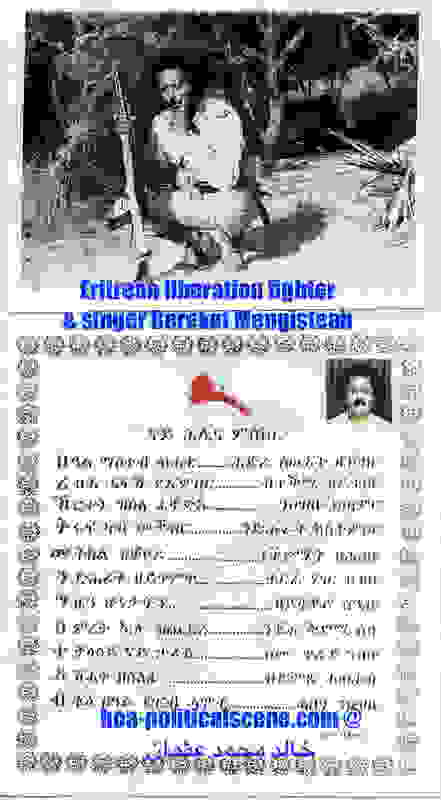 This article is here only to highlight the two revolutionary Eritrean principles and the differences between two mentalities in the Eritrean revolution and it is not here to polish the Eritrean leaders of the ruling front (PFDJ). That is the People's Front for Democracy and Justice. It is just about facts. 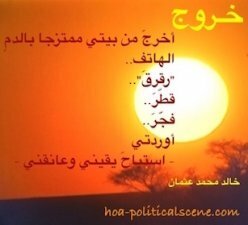 Continue the two Eritrean revolutionary principles at the Eritrean political scene here and from that page to the other pages. (Published on 2010-05-15). Let me read your thoughts about the revolutionary Eritrean principles. Use the form below. You can share this page about the revolutionary Eritrean principles with your services through the buttons below, at the left column or at the bottom of the page. Let us read your opinions about the Eritrean revolutionary principles through the following form. Well, in addition to political reading, you can read in two different themes about Eritrea, like for example tourism attraction and cinema, or Eritrean movies. See 100-beautiful-sites-in-the-world.com and TVCinemaApp.com. hoa-politicalscene.com/eritrean-revolutionary-principles.html - Eritrean Revolutionary Principles: Eritrean refugees fleeing SAWA. 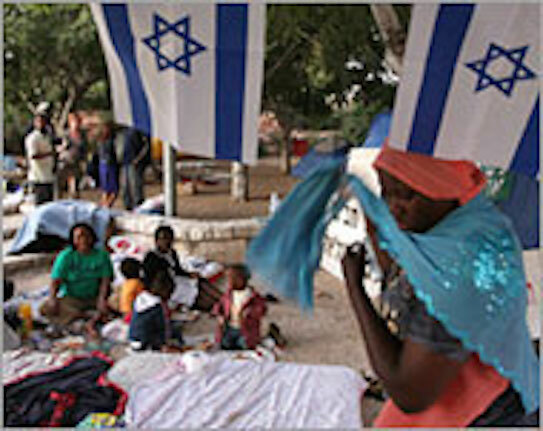 Those don't care even if enemies took their homes. What a shame? 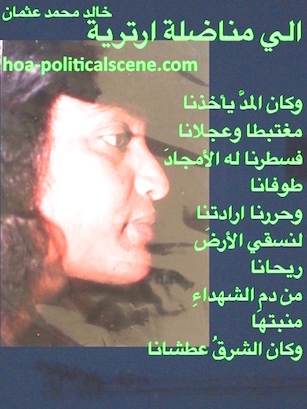 I used Site Build It on the text link at the bottom of the page to empower the Eritrean revolutionary principles. I use those strong website building and optimizing tools continuously to empower the entire HOA's Political Scene network.